‘Zealot’? A biography of Jesus could have no more provocative title. But it turns out to be the perfect one for Reza Aslan’s unearthing (or should that be un-heavening?) of “the Jesus before Christianity.” As he cogently demonstrates, the real Jesus — the radical Jew who preached, agitated, and was executed for his pains — was a far more complex figure than many Christians care to acknowledge. Given that turmoil, it should come as no surprise that “the Jesus of history had a far more complex attitude toward violence” than is usually assumed. Gentle shepherds don’t have much place here. Aslan reads the admonitions to love your enemies and turn the other cheek as directed toward relationships between Jews, not between Jews and foreigners, and especially not between Jews and occupiers. “The message was one of repossessing the land,“ he writes, “a movement of national liberation for the afflicted and oppressed.” A kingdom, that is, very much of this world, not another. This historical territory has been explored before, by biblical scholars such as Richard Horsley and Dominic Crossan. But in Aslan’s hands, it gains broader resonance. He brings to bear his expertise in the volatile territory of politics and religion (his earlier book Beyond Fundamentalism analyzed the root causes of militant religious extremism) as well as his deep background as a scholar of religion, renowned especially for the most readable history of Islam yet written, No god But God. Perhaps the most fascinating part of Zealot, then, is the analysis of how Jesus was tamed by his own followers, and why. Soon after his death, the early Jesus movement split between the “Hebrews” who stayed in Jerusalem under James’ leadership, and the Hellenists abroad led by Paul. The bitter infighting between them would be resolved by force majeure: the disastrous failure of the Jewish rebellion against Rome, which led to the torching of Jerusalem in the year 70 and the expulsion of surviving Jews from what remained of the city. With the ‘Hebrew’ faction thus in disarray, the Hellenist appeal of Paul’s Christianity won out, and Jesus’ specifically Jewish revolutionary fervor would be toned down to suit a much larger audience: the Roman empire itself. This entailed absolving the Romans from responsibility for the crucifixion, instead blaming the unruly (and unrulable) Jews, and thus laying the basis for two millennia of Christian anti-Semitism. Where the early Jesus movement was Jewish, Christianity would now be anything but. As Aslan notes, the gospels are, in this sense, a radical break with history – a wiping out of the specific past to be replaced by a universal future. Yet Zealot itself is testament to the fact that they didn’t quite succeed. Aslan’s insistence on human and historical actuality turns out to be far more interesting than dogmatic theology, and certainly more intriguing and exciting for any modern reader not piously devoted to the idea of gospel truth. This tough-minded, deeply political book does full justice to the real Jesus, and honors him in the process. Thank you Lesley for the review. It seems to be a very interesting book. 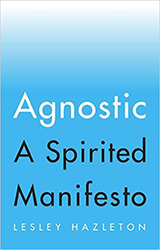 Annemarie Schimmel said in one of her books that, it does not matter what the fact was, what matters is, what people believe in. I suppose 3 billion plus people will continue to believe what they have been told for the last 2,000 years. I was watching a fox news interview with him and I was surprised at how ignorant the interviewer was. For a US writer who writes on religion and who already wrote a book on Islam, it would be a surprise for him not to tackle Christianity. Reblogged this on Von Melee. Please excuse me, Lesley, if this has been covered, as I haven’t quite managed to read through every email here (your About page). But I am wondering if you have been interrogated as thoroughly (credentials, etc.) by the “western media” regarding your book on the Prophet Muhammad (salallahu alayhi wa sallam) as heavily as Reza Aslan has on this book of his on (the prophet) Jesus (alayhi wa sallam). 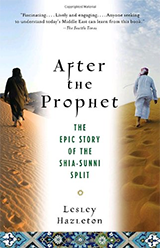 It occurred to me to ask this, having read and found certainly thought-provoking your fine book on the Shi’a split, and on Muhammad, and having viewed a good interviewer talking with him from Huffington Post, and read about the Fox interviewer, who (without viewing it) seems to have been less so. Have you been put on the defensive at all? Oh yes. Not as publicly, and not by “western media,” but some conservative Muslims have made it clear that for them, my Jewishness is as suspicious as Reza’s Muslimness is to Fox News. Basically they ask the same question: what made you, as a Muslim/Jew, write about Jesus/Muhammad. And behind that question, first, a challenge as to your “right” to do so, and second, the assumption of an “agenda” — in Reza’s case, anti-Christian, in my case, anti-Muslim. 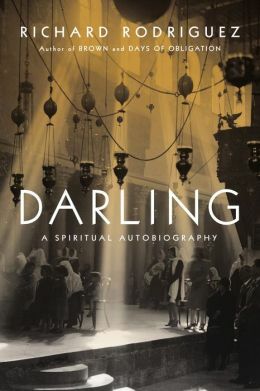 On the other hand, many thinking Muslims have welcomed The First Muslim, as you’ll see if you scroll through comments on posts about the book, just as many thinking Christians have welcomed Reza’s book. 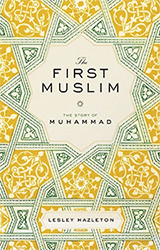 Humanizing history doesn’t undermine faith, as conservatives seem to imagine; both Jesus and Muhammad are not less but more remarkable when seen in their lived context and experience. I’ll be posting at greater length about all this very soon. What an excellent and humble response to an honest and obvious question. Kudos to you both. It’s a shame you have to entertain comments from some of my bone-headed co-religionists, who can’t see past your Jewishness. They tend to define themselves against what they’re not as to opposed to what they are and have done a fine job of covering beauty with filth. It reminds me of the Month Python sketch about the Spanish Inquisition.